We take a look at how developers can perform cross-browser automation testing locally using Watir and Ruby. Read on to get started! What Is Cross-Browser Parallel Test Automation? Cross-browser parallel testing is performed to run a single test across multiple browser combinations, simultaneously. This is a very practical and powerful scenario for automation testing. Cross-browser parallel test automation allows you to scale back execution time while not compromising with coverage of your check and leads to faster test results. Watir is an open source Ruby library which helps to achieve cross-browser automation testing. Watir supports Ruby, which is an object-oriented language and typically it’s simpler and faster than other languages. The good thing about Watir is that it supports any web application irrespective of the technology used to develop that application. It’s a free open source tool belonging to the Ruby family. It supports headless browser execution. It supports the page object design pattern. Tests' simplicity and flexibility can be maintained. It supports your web app no matter what technology you used to develop your app. It supports execution in the cloud through cloud-based, cross-browser automation testing tools. 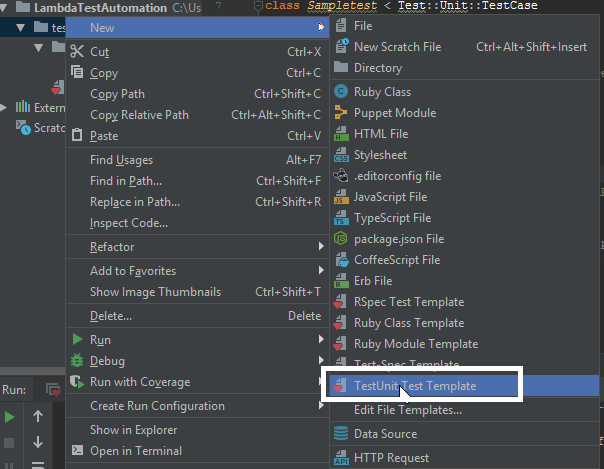 In this article, we will take a look on how to set up test automation environments for Watir with RubyMine IDE and then go ahead with the sample script. 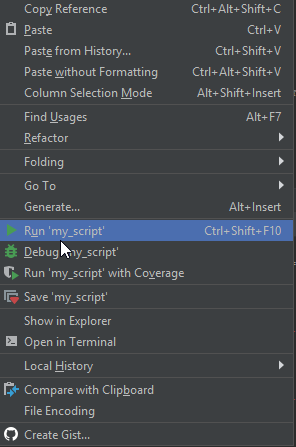 I would also like to show how to run the script and see the failure in RubyMine. Let’s dive right in. The RubyInstaller is must because Watir supports Ruby code, so this installation is very important before we proceed with automation. 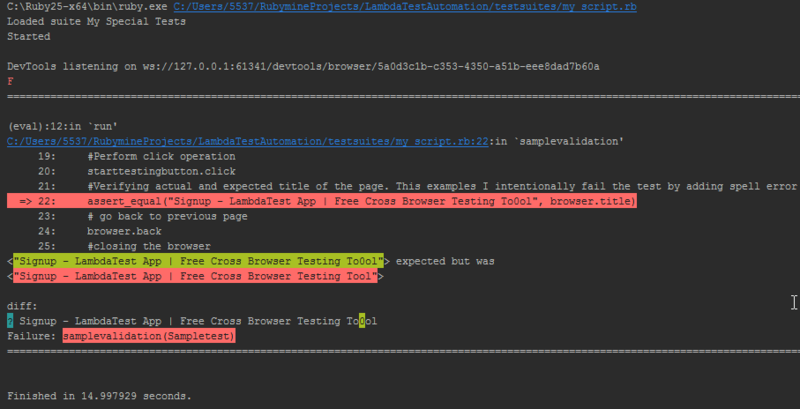 This section has detailed steps explaining how to setup the automation environment for performing cross-browser automation testing using Watir through Windows. 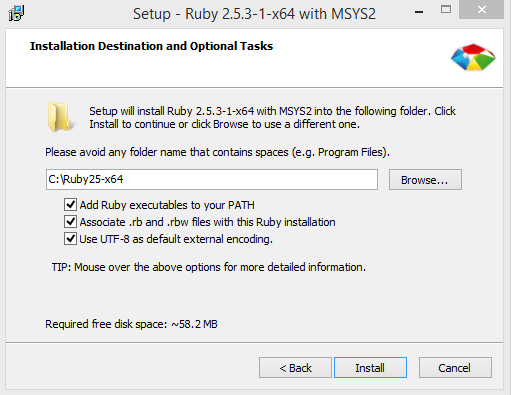 Navigate to the official RubyInstaller page here. Click on the latest version with DEVKIT and download it. Select your OS architecture type, for example I selected a (X64)64-bitt operating system. After download, right click on installer and run as administrator in Windows machine. 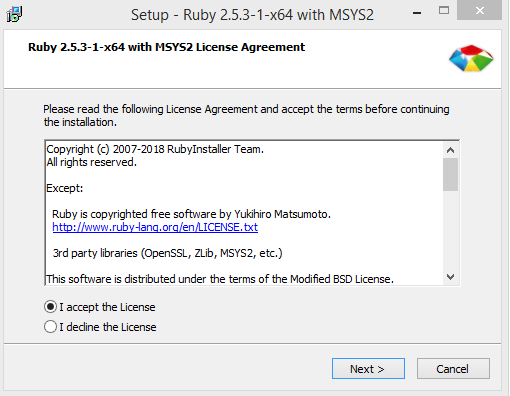 The setup window popups to accept license agreement, you need to accept this and move next. I would recommend selecting all checkboxes and clicking the install button to proceed further. 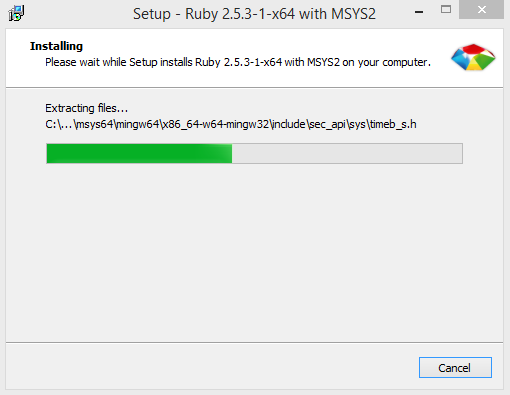 The below progress bar indicates the install is in-progress, which takes a few minutes time to install Ruby. After installation is complete, the following window will popup to install the updated component. This is optional; you can either leave it by closing the window or hit the “Enter” button to update all the components. The Ruby version that was installed is displayed in the command prompt. irb stands for Interactive Ruby Shell which is a REPL (read-eval-print-loop) for programming in the object-oriented scripting language Ruby. I will write some simple code that will put in “lambdatest.com” and print it. Gems are the package manager for the Ruby programming which provide a standard format of disturbing Ruby libraries. 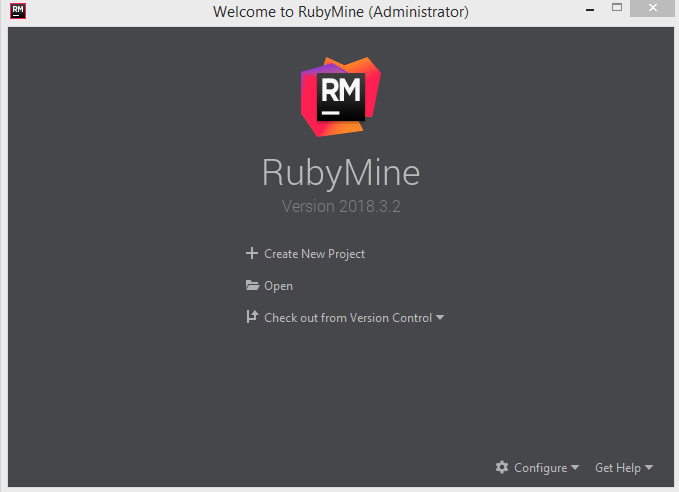 RubyMine is an IDE (Integrated Development Environment) that helps you to write, debug, and test code for your application. Ruby also support multiple OSs like Windows, MacOS, and Linux. Note: RubyMine comes up with a free 30-day trial license. Keep the default with the existing plugins and click Next until you see the below window. 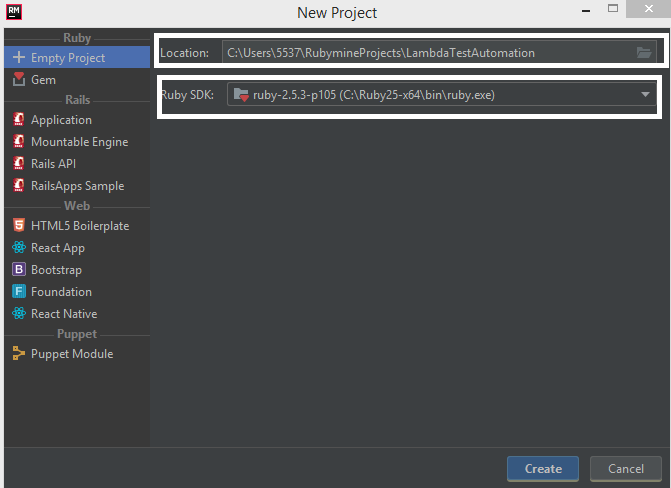 Enter the project name and select “Ruby SDK,” which will be available if you installed RubyInstaller. Create a subdirectory called “resources” under testsuites and drop it in the “chromedriver.exe” file. To run browser-based automation, ChromeDriver is required, which is a separate executable that WebDriver uses to control Chrome. To download ChromeDriver, visit here. Writing code in RubyMine is very simple. Enter the file name, “my_script.rb,” in filename and click OK. In the RubyMine window, write the following code. The above test script intentionally fails to verify results in terms of comparing actual vs. expected page titles. The below snapshot explains whey the test failed and the difference is highlighted. In the TestUnit template, the IDE automatically creates def setup and teardown. These methods actually run before and after the test. Setup: This method is a precondition to run the test. You may setup something like initialize browser or any test data setup. Teardown: This method is used after your test runs. You may close/quit the browser or delete the data in database. The above code is initializing ChromeDriver and creates a new instance and assign an object reference to the variable browser. The next line of code is typical Watir script (Note: The method name starts with “test_” which is mandatory for Unit Test Runner to actually realize this is test method). Click on “Start Testing” button in lambdatest.com. Finally, verify whether you get the expected vs. actual title.